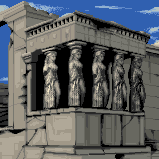 The Erechtheion Temple (properly the Erechtheion) is a temple in Greece that appears in the SNES, DOS, and Deluxe versions of Mario is Missing!. The Erechtheion is known for its six Caryatids, large statues that replace columns. One of those Caryatids is stolen by Koopa Troopas when Athens is invaded, and Luigi's task is to return it to its rightful place. He eventually finds it, brings it to the Erechtheion's information booth, and after proving that it is genuine by answering the questions below, it is successfully returned. Each Caryatid has a lovely face. What are they meant to replace? What is one thing the Erechtheion Temple has not been? The Erechtheion Temple's floorplan is very complicated. It was built to include many earlier temples that once stood on the same site. Over the centuries, the temple has been a church, a palace, a harem and a storehouse for the Greek military. Its most famous feature is The Porch of the Caryatids, a deck supported by six columns which resemble young girls. Each Caryatid stands 6 feet, 6 inches high. The girls' dresses look like the columns they replace. The Caryatids are copies. The originals were removed to protect them against pollution.